Ferritins synthesize ferric oxide biominerals and are central to all life for concentrating iron and protection against oxidative stress from the ferrous and oxidant chemistry. The ferritin protein nanocages and biomineral synthesis are discussed in terms of wide biological distribution of the maxi-ferritins (24 subunit ± heme) and mini-ferritins (Dps) (12 subunit), conservations of the iron/oxygen catalytic sites in the protein cages, mineral formation (step i. Fe(II) entry and binding, step ii. O2 or H2O2 binding and formation of transition intermediates, step iii. release of differric oxo mineral precursors from active sites, step iv. 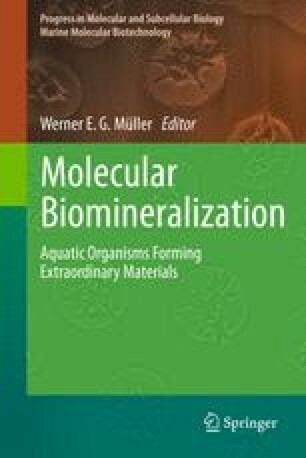 nucleation and mineralization) properties of the minerals, and protein control of mineral dissolution and release of Fe(II). Pores in ferritin protein cages control iron entry for mineralization and iron exit after mineral dissolution. The relationship between phosphate or the presence of catalytically inactive subunits (animal L subunits) and ferritin iron mineral disorder is developed based on new information about contributions of ferritin protein cage structure to nucleation in protein cage subunit channels that exit close enough to those of other subunits and exiting mineral nuclei to facilitate bulk mineral formation. How and where protons move in and out of the protein during mineral synthesis and dissolution, how ferritin cage assembly with 12 or 24 subunits is encoded in the widely divergent ferritin amino acid sequences, and what is the role of the protein in synthesis of the bulk mineral are all described as problems requiring new approaches in future investigations of ferritin biominerals. The authors are grateful for the contributions of all the members of the Theil Group. The writing of the manuscript and work described herein were supported by the CHORI Foundation (ECT), the NIH (DK20251) (LB and ECT), and a Rubicon Fellowship from the Netherlands Organization for Scientific Research (NWO), (LB).